This is the most widespread ibis species, breeding in scattered sites in warm regions of Europe, Asia, Africa, Australia, and the Atlantic and Caribbean region of the Americas. It is thought to have originated in the Old World and spread naturally from Africa to northern South America in the 19th century, from where it spread to North America. This species is migratory; most European birds winter in Africa, and in North America birds from north of the Carolinas winter farther south. Birds from other populations may disperse widely outside the breeding season. While generally declining in Europe it has recently established a breeding colony in Southern Spain, and there appears to be a growing trend for the Spanish birds to winter in Britiain and Ireland, with at least 22 records in 2010. 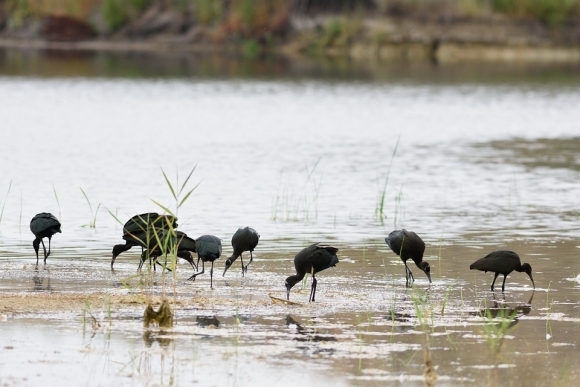 Glossy Ibises undertake dispersal movements after breeding and are very nomadic. The more northerly populations are fully migratory and travel on a broad front, for example across the Sahara Desert. Populations in temperate regions breed during the local spring, while tropical populations nest to coincide with the rainy season. Nesting is often in mixed-species colonies. When not nesting flocks of over 100 individuals may occur on migration, and during the winter or dry seasons the species is usually found foraging in small flocks. Glossy Ibis often roosts communally at night in large flocks, with other species, occasionally in trees which can be some distance from wetland feeding areas. Glossy Ibis feed in very shallow water and nest in freshwater or brackish wetlands with tall dense stands of emergent vegetation such as reeds, papyrus or rushes) and low trees or bushes. They show a preference for marshes at the margins of lakes and rivers but can also be found at lagoons, flood-plains, wet meadows, swamps, reservoirs, sewage ponds, paddies and irrigated farmland. It is less commonly found in coastal locations such as estuaries, deltas, salt marshes and coastal lagoons. Preferred roosting sites are normally in large trees which may distant from the feeding areas. The nests are usually a platform of twigs and vegetation positioned at least 1m above water, sometimes up to 7 m in tall, dense stands of emergent vegetation, low trees or bushes. This species is a mid-sized ibis. It is 48–66 cm (19–26 in) long, averaging around 59.4 cm (23.4 in) with an 80–105 cm (31–41 in) wingspan. The culmen measures 9.7 to 14.4 cm (3.8 to 5.7 in) in length, each wing measures 24.8–30.6 cm (9.8–12.0 in), the tail is 9–11.2 cm (3.5–4.4 in) and the tarsus measures 6.8–11.3 cm (2.7–4.4 in). The body mass of this ibis can range from 485 to 970 g (1.07 to 2.1 lb). Breeding adults have reddish-brown bodies and shiny bottle-green wings. Non-breeders and juveniles have duller bodies. This species has a brownish bill, dark facial skin bordered above and below in blue-gray (non-breeding) to cobalt blue (breeding), and red-brown legs. Unlike herons, ibises fly with necks outstretched, their flight being graceful and often in V-formation. The common name Black Curlew may be a reference to the Glossy Ibis and this name appears in Anglo-Saxon literature, indicating that it may have bred in early medieval England but Walden & Albarella do not mention this species.